We bet you didn't think your little one had much of a work ethic yet, huh? Waiting tables, taking orders, even bussing dirty dishes didn't seem in her repertoire just yet. But you overlooked one key element of this clever costume—just how much your child will do to be close to her favorite treat...donuts! It started innocently enough when she was in preschool. On Fridays, if she'd gotten a good report from the teachers, you'd stop at the donut shop on your way home. Then it became all she wanted as a birthday treat. That led to her asking for donuts as stocking stuffers, and a list for Santa that read simply: Dear Santa, all I want for Christmas is donuts. And now, well, the girl is gaga! So much so that you didn't even notice when she went in and applied for a job at the donut shop; now that she's got it, she'll need a look worthy of her new pastry position. 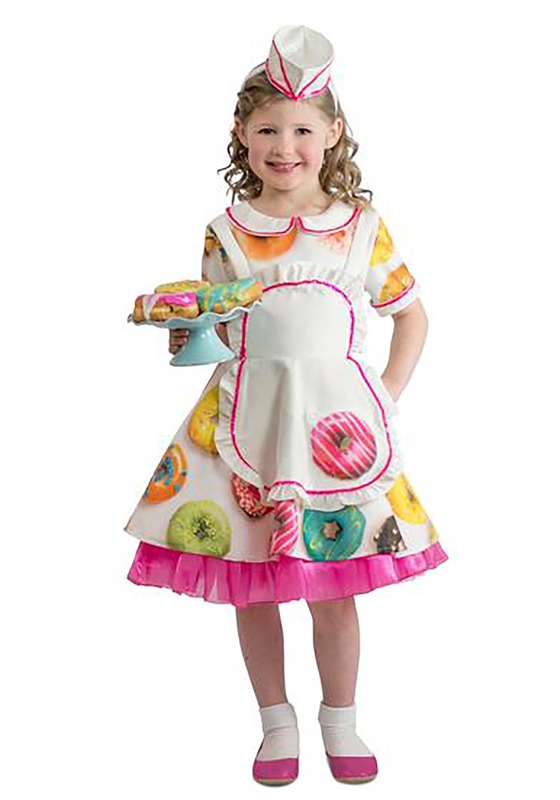 This Toddler Donut Waitress Costume is a surefire way to get her fired up for her first day at the shop! She'll love serving all her customers and describing, in detail, the flavors of the day! That's because this look is as fun as a box of fresh-from-the-oven, sprinkle-topped donuts. The dress has a photorealistic donut print, and the apron features one coordinated pink confection. Sweet details like a pink petticoat, trimmed collar, and little diner hat add to this darling look and help your child power through her many new responsibilities with giddy glee! Of course, the job is imaginary, but the fun of Halloween is making it feel real to her (plus, she may even learn to clear the dishes). And before you ask how she got so good at talking about sprinkles, icing, and filling, think about it; you know the answer. A good salesperson needs to sample what they're selling, in order to accurately describe it!